Therefore, we need a solution to enable security teams to automate and orchestrate their IR (incident response) processes, with tight alignment with people, process, and technology across the organization. Without a systematic prioritization or risk assessment technique, incident responders may experience alert fatigue and ignore the crucial alerts. The NCCIC Cyber Incident Scoring System (NCISS) was introduced to address this concern. NCISS uses a weighted arithmetic mean to produce a score between zero and 100. 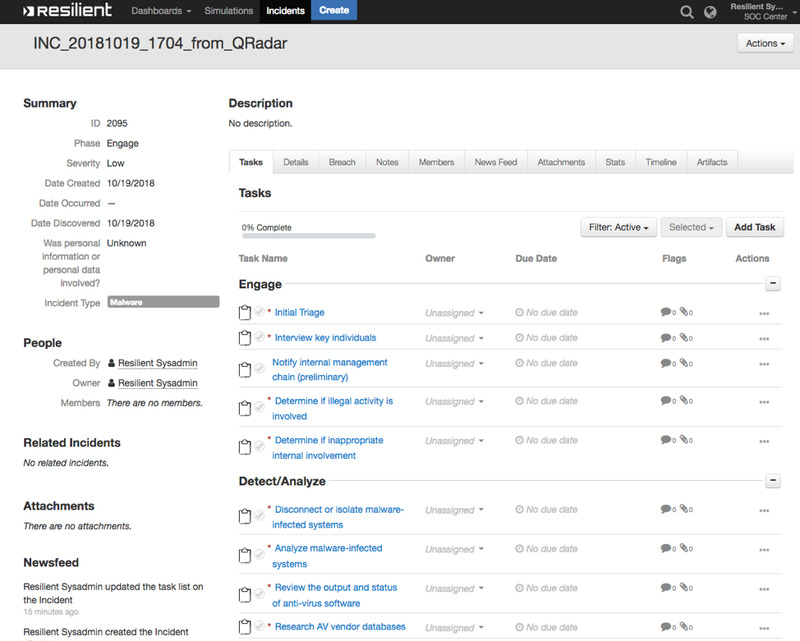 This score drives incident triage and escalation processes- determining the prioritization of limited incident response resources and the necessary level of support for each incident. In this article, we will leverage the IBM Resilient Incident Response Platform and develop a dynamic playbook to assist the security team in determining the overall risk by integrating NCISS. A dynamic playbook is the set of rules, conditions, business logic, workflows and tasks used to respond to an incident. 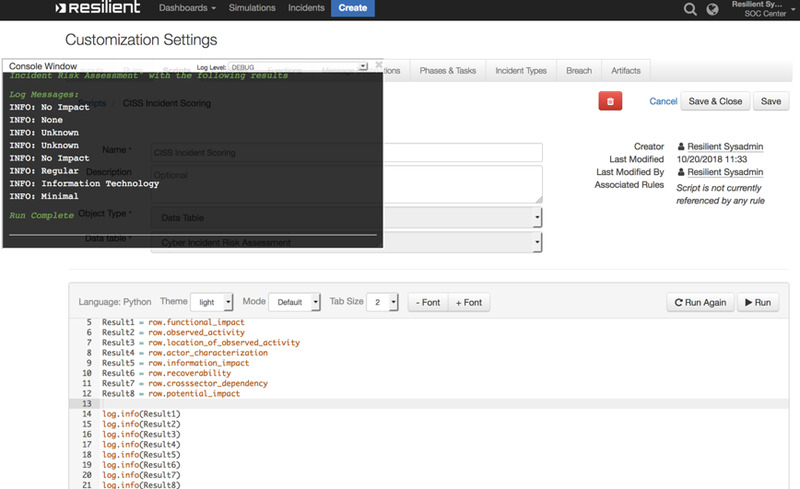 The Resilient platform updates the response automatically as the incident progresses and is modified. Essentially, the playbook is the Resilient platform’s implementation of your incident response plan. 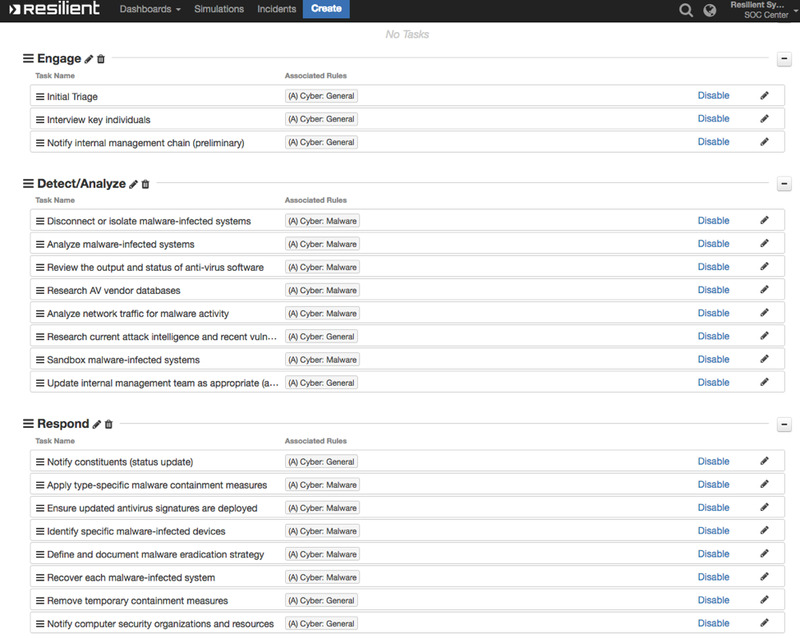 IBM Resilient provides many canned playbooks with comprehensive incident handling and response actions. Users can leverage these and also customize them to best fit their organization’s need. Please refer to Playbook Designer Guide for more detailed information. There could be hundreds of similar incidents in a large organization. Intelligent strategy includes the prioritization of these incidents. This allows the IR team to devote their time to high severity incidents using a risk assessment. In order to have a quick risk assessment, we want to customize our playbook to adopt NCISS in the Initial Triage task. 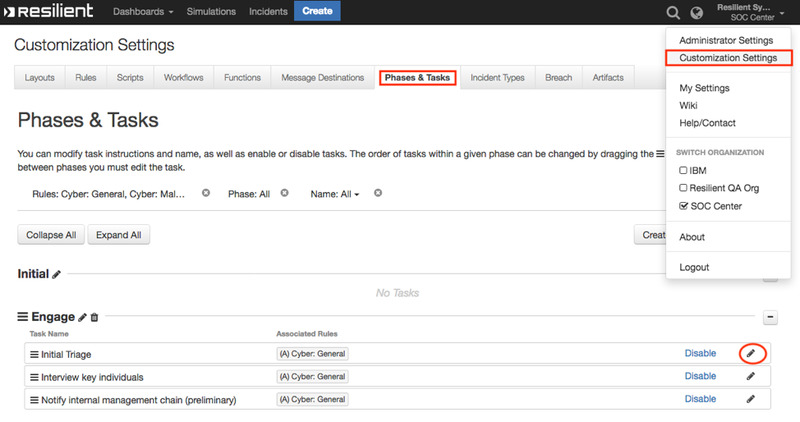 To customize the task, please go to Customization Settings > Phases & Tasks, and edit the Initial Triage task. The user interface makes it easy to drag and drop the different elements into a layout. In the following example, we plan to add a data table (organizing the field values in a spreadsheet table format), and a custom field (to present the final calculated risk score). Please click Add Table to create a data table. Then we can give the name of the data table. The first name is used for UI presentation, and the second name is used for API usage. Next, we can create columns. Even when a data table is created, we can still add more or delete columns. For each column, we give it the appropriate column name, data type, option values, default option, optional tooltip and make it required or not. In our example, we pre-defined the options listed in NCISS, and made the default value with the item unknown or with the lowest scoring. After defining all the columns, we can open a preview and adjust the column width if applicable. 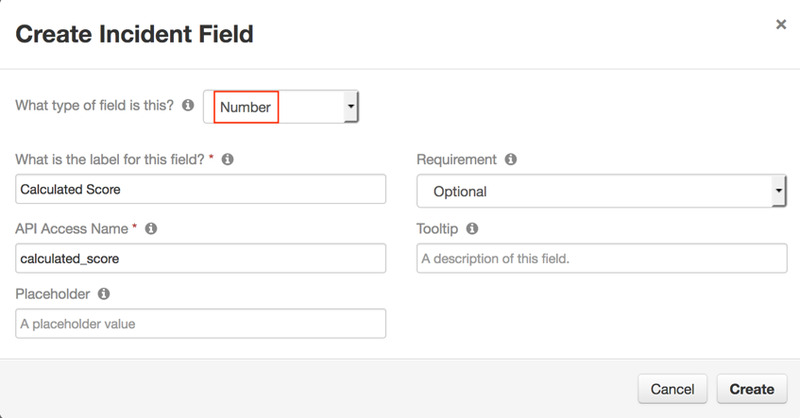 After clicking Create, click Add Field to create a custom field. It is usually used when the default fields cannot fulfill our specific needs. 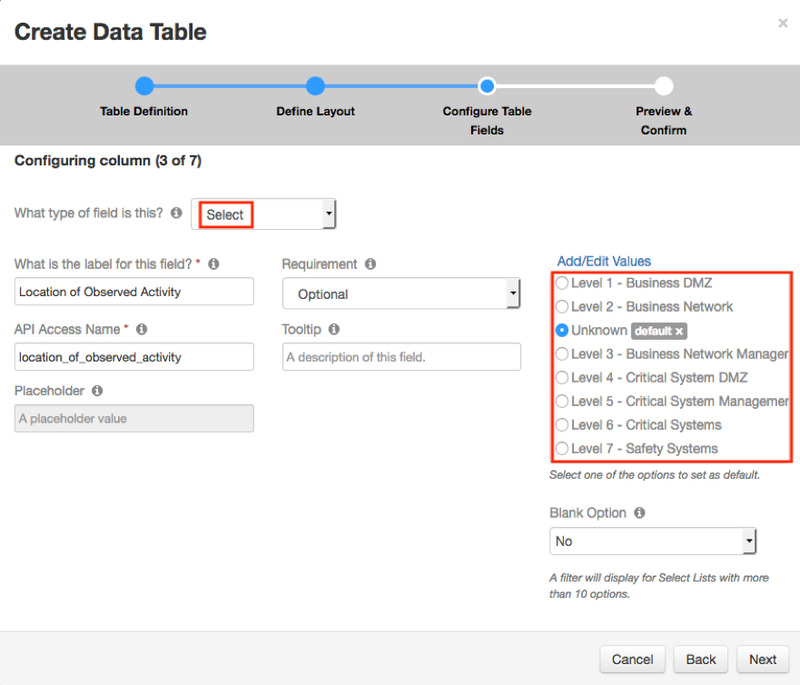 Like the columns in the data table, we also specify the data type and other requirements in the modal for field. In this example, we use Number type to present the calculated risk score. 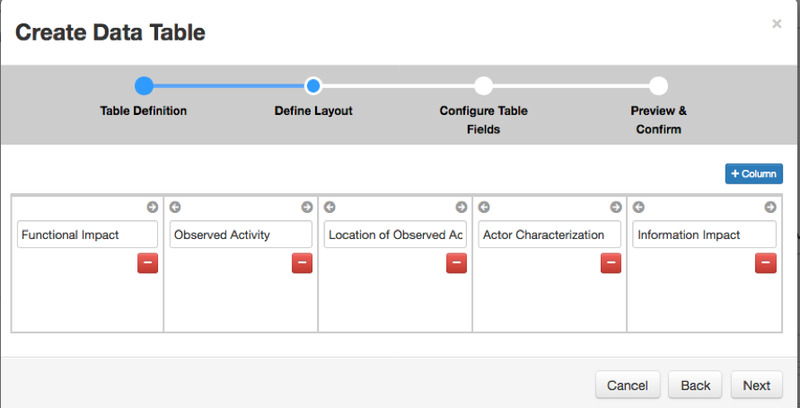 After creating the data table and custom field, let’s use drag and drop to put them in the Incident Fields. Click Save and Close button to save the layout. With the necessary elements and layout prepared, it’s time for us to create the logic to process the user input data during incident initial triage. The Resilient in-product scripts feature allows users to write Python scripts to access incident data, and implement more complex business logic. Scripts can be triggered by rules or workflows. For more details, please visit Learn about Scripts. Create your first script via Customization Settings > Scripts page. Tip: When we first experience the script implementation, we can create a simulation incident and use “log.info” and Run against the simulation incident for real-time result verification or troubleshooting. When we are familiar with the script, we can remove the test codes and implement the programming logic to handle the user input, map the selected option to corresponding score, and use the suggested criteria to map the calculated risk score to different severity levels. The script does not execute automatically. To make that happen, we need to create a rule or workflow to integrate with the script. In this example, we plan to create an automatic rule to trigger the script under certain conditions. Please go to Customization Settings > Rules and click New Rule > Automatic. First, we give it a name and select the object type that the rule applies to, and set the condition to automatically trigger the rule. 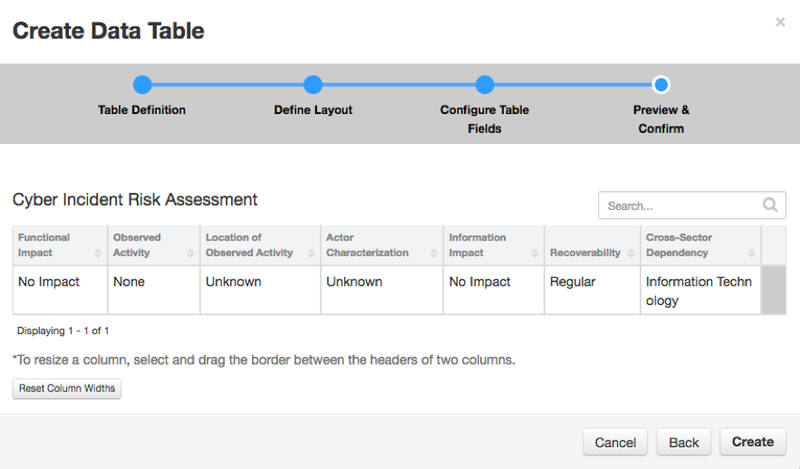 In this example, we set the object type Data Table: Cyber Incident Risk Assessment and condition as Row is Created and trigger the script when the condition is matched. 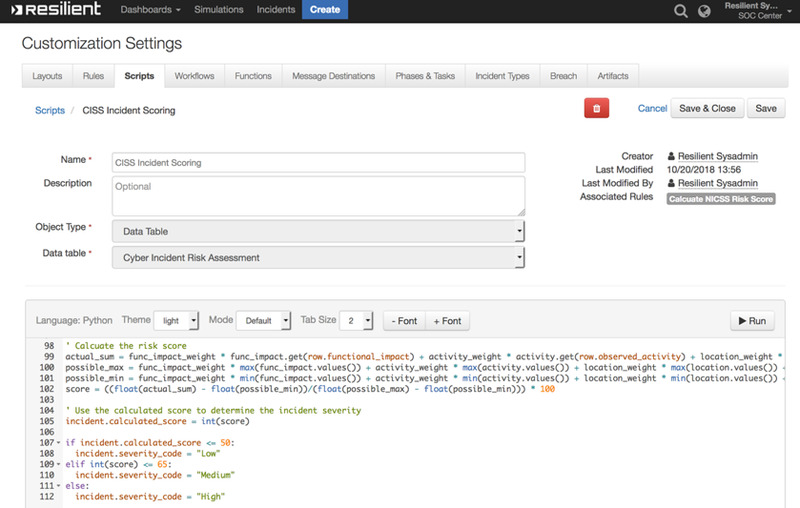 Therefore, as soon as the incident responder inputs the triage result, the rule executes the script to manipulate the data, calculate the risk score, and escalate the risk level in seconds. When finished with the playbook design, the next step is to verify the execution result and adjust the logic if applicable. 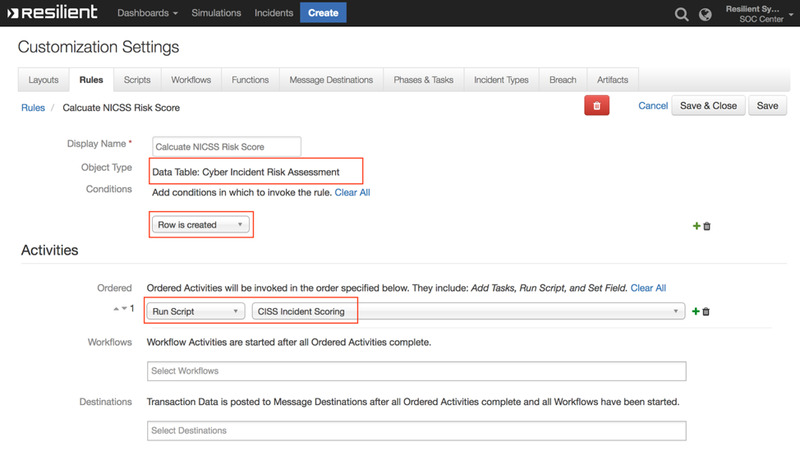 We can create a simulated incident to deal with the Malware incident type. Then we go to Initial Triage task and click Edit. Now we see the data table we created. We can use the drop-down menu to select the values in individual columns, and click √ to save the setting. After clicking √ to save, we can see the Calculated Score field has been updated with the risk score. If another row is added to reflect the latest status of the incident, the field will be updated immediately to reflect the result. If the score is over the pre-defined threshold, the Severity of the incident is automatically escalated to High. Besides the advantages for incident responders to prioritize their tasks, if the risk is escalated to high, users can create other business logics. This includes escalating the incident to Tier-3 Analysts for their emergent attention, or escalating the event to a CISO or legal team for immediate risk mitigation. In conclusion, we’ve experienced the user-friendly interface, flexible and conditional incident handling, and powerful automation and orchestration capability in-product. This step-by-step introduction to enhancing risk assessments using the NCISS integration provides framework for an IR team to handle incidents more efficiently. 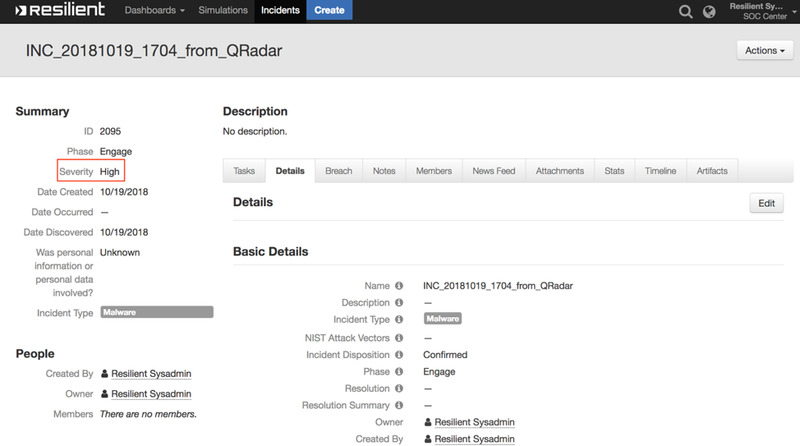 To learn about the full features within IBM Resilient Incident Response Platform, please visit https://developer.ibm.com/security/resilient/.